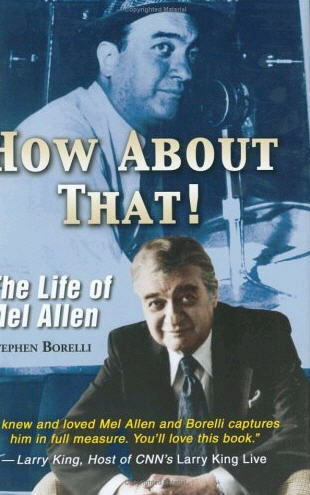 Book on Mel Allen, How About That! Mel Allen was much more than voice of the Yankees. One day in the ‘50s, “the best broadcaster ever” got a phone call from a young man in the Midwest who was entertaining the idea of becoming a broadcaster and wanted some tips. Mel patiently talked with him for nearly an hour. The young man eventually opted to follow another career path. “Mel always had time for people; that’s why he never had any time for himself,” Larry Allen, Mel’s brother, says from Montgomery, Ala., offering a hint of the same comforting voice that made Mel Allen so popular for decades with Yankee fans and as host of “This Week in Baseball” for 19 years, the “Baseball Tonight” of its time. In 1964, after 25 years as a Yankee broadcaster, Allen was unceremoniously fired. Years later, he was re-hired and became a confidant of the man who once called him for those tips- George Steinbrenner. June 16 marked the 10th anniversary of Allen’s death. At the age 0f 83, he died soon after watching the Yankees, under their first-year manager Joe Torre, beat the Indians. That day a young reliever came on in the sixth and recorded five of his eight via strikeouts- >b>Mariano Rivera. “Mel was the soundtrack of Yankee success and he would have loved Torre and his teams,” notes Stephen Borelli, author of How About That! The Life of Mel Allen. Mel would have admired Torre in the way he admired Casey Stengel as a master psychologist. “In many ways, Mel was New York baseball,” Borelli adds. “He was the voice and later when television came about, the face of the Yankees dynasty. Fans hinged on his every word and associated him with their unprecedented winning as much as they associated the players with it. And to the Dodgers and Giants fans, Mel was just as much the enemy as Mickey Mantle. Coleman won six World Series with the Yankees, all called by Allen. After retiring as a player, he moved into the front office for several years before finding his way to the broadcast booth, following the lead of his former double-play partner Phil Rizzuto. Allen graduated from the University of Alabama, where he was a schoolmate of an end named Bear Bryant. The school has had a scholarship in Mel’s name since 1983. With the Yankees, Mel broke in the likes of Curt Gowdy and Russ Hodges. When Boston owner Tom Yawkey, a friend of Allen’s, asked for a recommendation , Mel was quick to tab Gowdy. He did the same for Hodges when Giants owner Horace Stoneham called. No one told it better. For more information or to purchase Stephen Borelli’s book, How About That! The Life of Mel Allen, visit our “Sportscasting Books” section.